NASA astronauts like Sunita Williams stake their lives on the training they receive, including how to wear and function in their spacesuits on spacewalks. The NASA engineer who provides this training is Sabrina Singh Gilmore. Married to NASA engineer Adam Gilmore, Singh told India-West by phone from the NASA Johnson Space Center in Houston, Texas, that she “wanted to work at NASA since I was in the fifth grade,” even writing a letter asking the U.S. space agency for career advice. “Honestly, they didn’t laugh. They were very professional and they gave me some great advice,” she said. Born in Atlanta, Ga., Singh studied mechanical engineering at Georgia Tech and received a master’s degree in biomedical engineering from the Emory University School of Medicine and Georgia Tech. She has frequently been to India to visit relatives in Simla at the foot of the Himalayan Mountains. Singh knew that NASA offered internships through its cooperative education efforts, so she applied to the program while attending college. 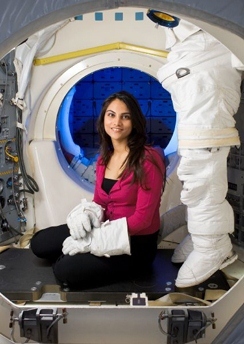 Her co-op projects, Singh said, have included designing a refrigeration system for cell cultures, testing and certifying MP3 players for astronauts on spaceflights, being certified in the fire detection and suppression classes she taught to astronauts, and developing tests and operational procedures for tile repair as part of the post-Columbia and Return to Flight trainings. Read more about Singh's experience at NASA on IndiaWest.